Stylistic trends even go beyond the actual street art and graffiti and into styles of documentation. Between Instagram, Flickr, high dynamic range (HDR) photography, Photoshop, and the general availability of quality digital cameras for cheap coupled with even cheaper memory space, photography has become part of many a street artist’s practice. Whether the photograph is taken by the artist themselves or by a fan, it is now possible for a piece of street art or graffiti to be photographed and quickly altered to the point where it is barely recognizable. Work that is relatively humdrum in person can appear absolutely amazing in a photograph and for work that looks amazing exactly as the artist intended can be distorted into something completely different (sometimes for better, sometimes for worse). With some of these photos, a new but not entirely separate artwork is arguably created, with these distorted photos often being noticed by more fans than the physical piece. 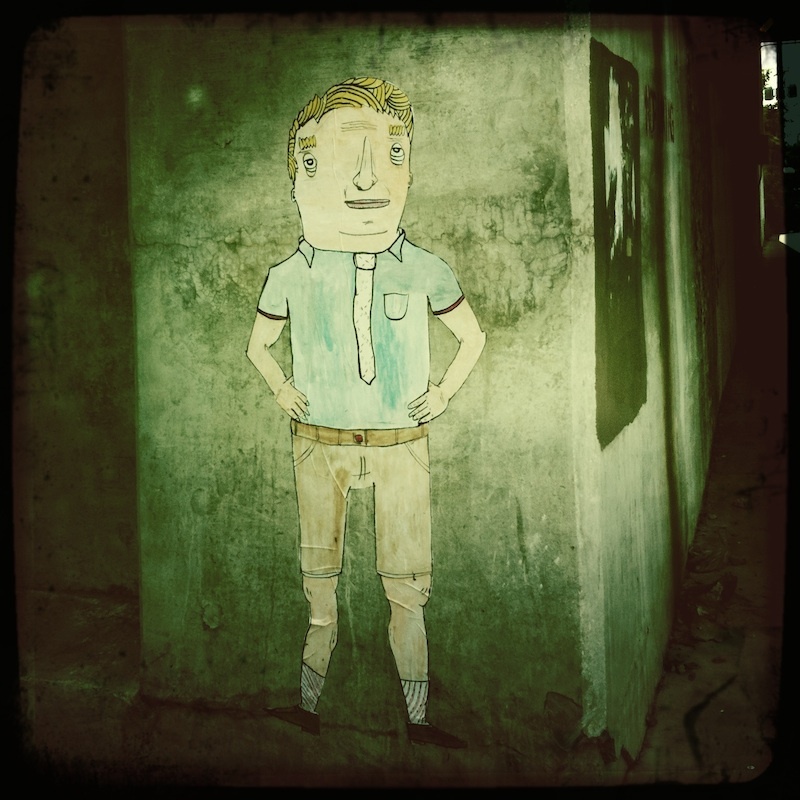 A wheatpaste by Don’t Fret. The photo has been heavily manipulated in the Hipstamatic application. Photo by Seth Anderson. Instagram has been a strange innovation for street art, and it’s popularity among artists and fans has certainly been one of the most significant shifts in street art since Flickr. The addition of simple photo filters (either in Instagram, Hipstamatic or other smartphone applications) has elevated fans to the level of artist collaborators and filters plus the low resolution of Instagram photos have forced artists to consider their work in a very different way. Before Instagram, some artists were considering the photos of their artwork as art in and of themselves, but now that Instagram has become the go-to place for posting or viewing photographs of street art, that consideration is practically a given. It’s obvious to any Instagram user, but bears stating outright, that a piece of street art (or anything for that matters) looks very different in person than it does when photographed and uploaded with a Toaster filter and the Lux feature enabled. Just as Instagram can make mediocre snapshots look like they’ve come from professional photoshoots, Instagram can make mediocre street art look world-class and world-class street art look inconsequential. An extreme example of photos having more impact than the actual work, as well as the distortion of the work to the point where photos are no longer pure documentation, are the images on Jeremy Gibbs’ Flickr page. Gibbs has taken many stunning HDR photographs of street art and graffiti in abandoned places, the best of which made it into his book Out of Sight. Gibbs has photographed pieces by artists like the Burning Candy crew and Roa that would otherwise be seen by almost nobody, and he’s photographed the work with great skill. As Gibbs notes in Out of Sight, painting in abandoned places affords artists opportunities to take all the time they need and to experiment in ways that are not possible when they are putting up work in highly-trafficked areas. Combine that freedom with Gibbs’ skills as a photographer and you have the recipe for some great art. But some might argue that it is not street art, since much of what Gibbs photographs in these abandoned locations was not really painted to be seen in person. I say that this work is street art though, and that Gibbs’ Flickr is a street corner with giant spotlights shining on the wall at all hours so that the work looks as good as it possibly can. That’s a possibility that the internet has opened up: Street art that you won’t see in person which becomes popular in part because it is so well photographed, and because those photos are distributed freely and quickly online. 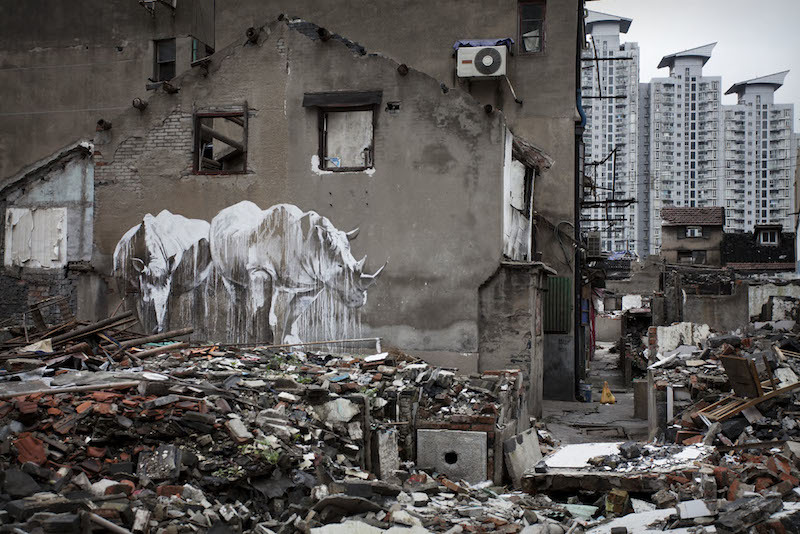 “the taming of the beasts” by Faith47 in Shanghai. Photo by Faith47. Some artists seem to have caught onto this trend and take full advantage of it. One example is Faith47. While she lives in South Africa and began her street art and muralism there (although now she travels extensively and paints wherever she goes), her work has been regularly featured on blogs like Wooster Collective for years. Faith47’s work is good. But there are hundreds, maybe thousands, of street artists who produce good work. One thing that has set Faith47 apart are her efforts to document her work well. While Faith47 can be equally happy painting in the middle of a busy city or in a township where there are no other people painting walls or even abandoned places where few people are likely to ever see the work, proper documentation of the finished product is a key part of her process. When I look at photographs that Faith47 has taken of her work, I consider the entire photograph as a composition, not as documentation of a mural. This puts Faith47 at a huge advantage over other street artists whose photographs are not as well-produced and are just about documentation. This sounds lazy, but with the photographs of those other artists, the viewer has to strain slightly to consider the work in the context of its location and imagine what finer details of a piece may have been lost. With Faith47’s photographs, there is no such strain, just enjoyment. It’s the difference between a play with a makeshift set and a Hollywood film. Faith47’s photographs provide a richer experience of her murals, many of which her fans are unlikely to ever see in person. 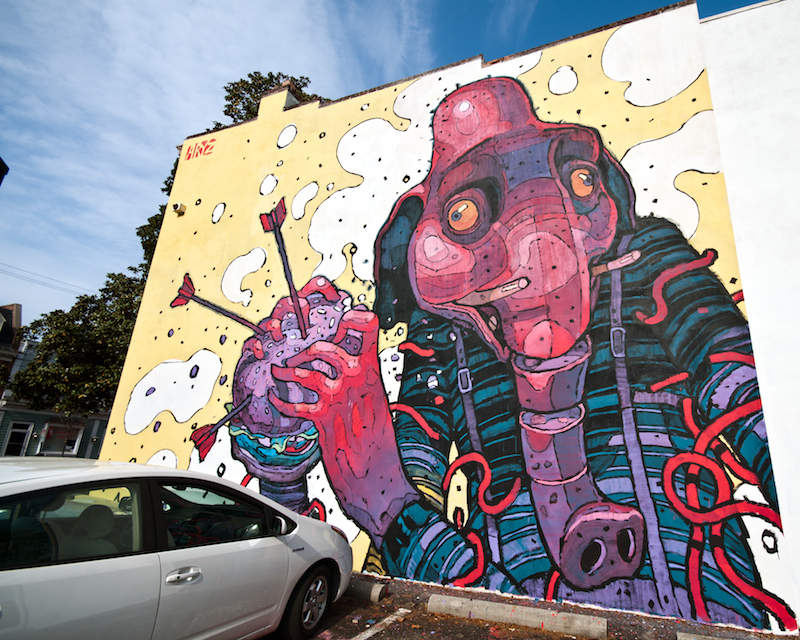 Work by Aryz in Richmond, Virginia where the photographer appears to have boosted the saturation of the image. Photo by Bill Dickinson.